54.5cm (21.5'') high/long, 31.5cm (12.4'') to 22cm (8.7'') wide, and 11.5cm (4'') deep. Stone type: medium-grained, massive sandstone. 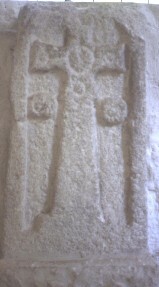 Cross slab, or possibly grave-marker, dated to the late eighth or early ninth century. The sides and the arched top are framed by a flat-band moulding. The cross is elevated and set in a single-block base. The shaft of the cross tapers sharply to the cross-head. The head is surrounded by a fine roll moulding. There is a large boss in the centre of the cross, with an incised line which may be secondary. In the centre of each arm there is a small roundel. On either side of the shaft, just below the cross-head there are bosses, which seem to have been decorated. These may have represented the sun and moon (Hawkes). Cramp, Rosemary, County Durham and Northumberland. Corpus of Anglo-Saxon Stone Sculpture Series 1st, Oxford University Press, Oxford (1984) Stones, sculpture, Churches, Anglo-Saxons, England..